Editor’s note: As part of our Most Influential Post of 2013 contest, we are re-publishing the articles that attracted the most reads, social media shares and comments of the year. This article was the most-viewed for June. To see the full list of the most popular posts in 2013 and to vote for your favorite, click here. Doctor Galli (Galli means “lane” in Hindi) in Goregaon East, Mumbai, was buzzing on a June morning, with people running errands in a sunny break between early monsoons. 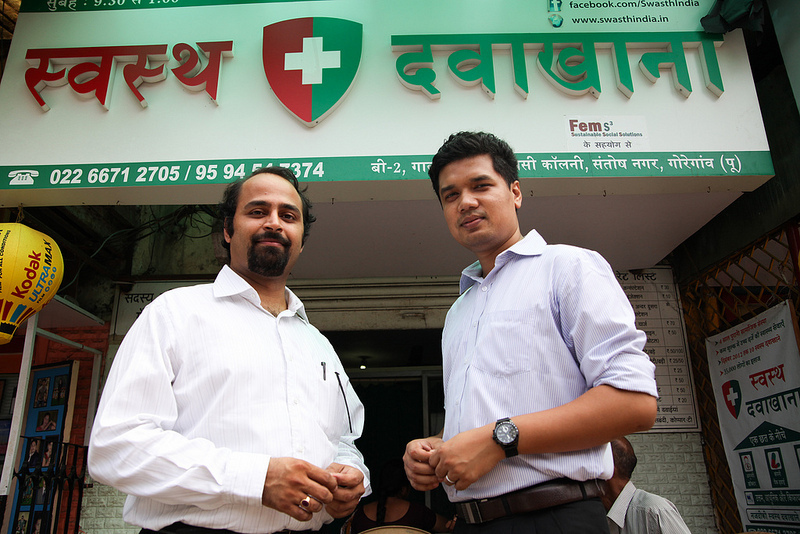 Sandwiched between tiny wedding photography studios was a 135-square-foot outlet of Swasth Health Center, Sundeep Kapila and Ankur Pegu’s growing primary health chain. Families sat in plastic chairs waiting to see the doctor, served by nurses clad in neat white uniforms. After a short wait, patients brought their Swasth cards inside for check-ups: fifty cents to see the doctor and get basic medications, like paracetamol, or a dollar for a visit – including a first-line antibiotic. Then it’s back to work as cleaners, drivers, rickshaw-wallas, construction workers, or one of the hundreds of other trades proffered by this hard-working population. Kapila and Pegu were across the street visiting their new dental storefront, one of three dental care providers in their two year-old chain of 12 low-cost primary care clinics. Three of the 12 opened in the past few months, and they have at least 20 in the pipeline for the coming year. They operate in densely populated neighborhoods on a seven-mile stretch of the Western Express Highway from Goregaon-East to Dahisar-East. Here in Goregaon East, Swasth Health Center is competing well against the other “doctors” on Doctor Galli, who prescribe medication (sometimes just a placebo injection) despite being unqualified as physicians. Swasth’s clinic here is fairly new, but it’s beating almost all of the competition: on this block, eight practices and three pharmacies. Swasth is having similar success in other locations, seeing about 60 patients per day in catchment areas of 200,000 people. Swasth advertises on its website that its clinics stay open from 9:30 am to 1:00 pm, and again between 5:30 and 10:00 pm. Seventy percent of their patients come after 5:00 pm. Government facilities, which Kapila says open only during mornings, are less convenient for the working poor. Kapila and Pegu each spent six years consulting for McKinsey and KPMG for health care and other businesses. The two men, old friends who attended secondary school together in Mumbai, like to geek out about optimizing their operations using a super-efficient logistics chain and management software. Thanks to their connections in the pharmaceutical industry, they have cut out several layers of middle men, purchasing medication at a steep discount, and still pricing it at about 40-50 percent less than their competitors. Swasth is partnering with VisionSpring to conduct vision screening and sell low-cost eyeglasses at several clinics. On Doctor Galli in Goregaon East, vision screening will be collocated with dental care. The company got connected with VisionSpring through Jared Hutchinson, who has extensively used the Center for Health Market Innovations to identify partnership opportunities. With Mumbai’s staggeringly dense population—there are approximately 20,000 people per square kilometer in this city of about 12 million—they believe its neighborhoods could absorb 100 centers. When the Mumbai market is saturated, they hope to open centers in its eastern outskirts, followed by other western Indian cities. Service expansions are top-of-mind. Pre- and post-natal care will be offered to women in the community. They plan to provide better diagnostics at point-of-care, such as malaria detection kits. They feel dermatology would be a valuable add-on. Early detection and compliance protocols for diabetes and hypertension will help manage these increasingly common illnesses—they’re interested in using protocols from existing organizations, rather than creating them from scratch. Swasth raised capital from friends and family about two years back, when they embarked on this delivery model. Now that the model seems to be sustainable, they are in the process of raising formal capital for expanding to another 50-60 centers over the next two years. Contact Kapila and Pegu on CHMI to learn more about this expanding business.